Jenga Bed. - You don't know me. And, a new way to play Jenga. Gallant waited impatiently in bed while he wait for the rufies he slipped Goofus to take effect. I'm never going to be able to read Highlight's to my son again without thinking of this. What have you done! ...but bad boys sleep more soundly. "Well, if you're sure, but you don't know what you're missing..."
"Little Timmy believed in the rule over his head so much that upon seeing little Johnny break them he stappled Johnny's sheets around him to teach him a lesson. "-sorry I've been writing about AIDS all night and I'm really zonked. And what have you been writing? Its an analytical paper on how the mainstream media failed in its duty to report on anything media during the AIDS crisis in the 80's, and also why they reacted the way they did. Oooh, interesting. Think they were directed by the government not to report? I've always wondered that. no, The government at the time simply just didn't care enough to fund proper research or education. its harder than you think for outside groups to presure the media. However the major flaws of all the mainstream sources really hinged on latent homophobia of editors, as well as very old prudish standards. Again this is over simplified, because the paper is about 1300 words worth of anlyisis. is the one in the green getting the one in the blue to do it for him? 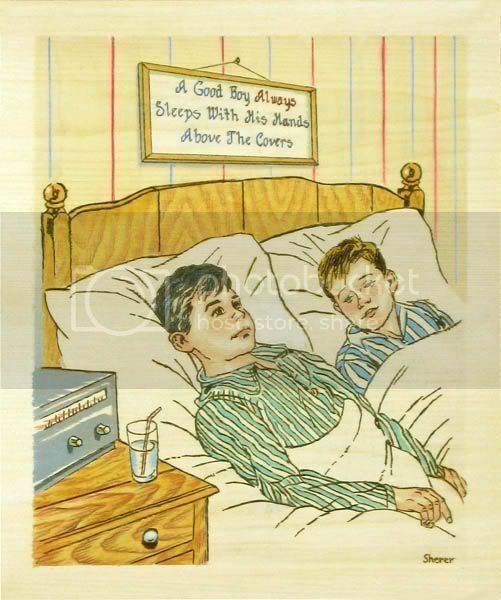 "While Jimmy slept peacefully next to his brother, Timmy practices his "technique" through the blanket, for fear that the crochet saying above his bed would find out." "Haley Joel Osmet practices for his upcoming role in A.I. 2, the Revenge."